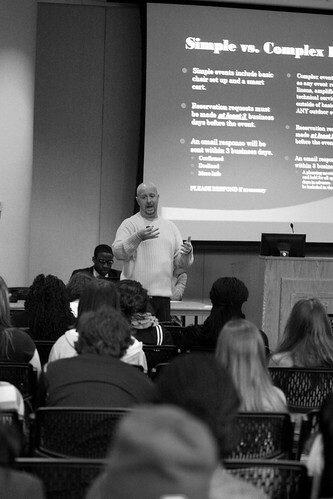 SAM OSHLAG TTN Student Center Director Jason Levy addresses Temple Student Government’s weekly assembly. Last night’s TSG meeting addressed room reservations and committee activities. Student Center Director Jason Levy addressed student organizations at the Temple Student Government General Assembly Meeting on Monday, Nov. 28. Levy discussed concerns from organizations about the Student Center’s ability to process room reservation requests and showcase the updated reservations website. He noted that room requests for complex events, events that require technology assistance, food and beverages or expanded seating, require a 20 business day notice. Levy and TSG Vice President of External Affairs Elliot Griffin explained that some operations costs for events at Student Center facilities can be covered by student organization allocations. Samuel Bias, co-chair of the Local and Community Affairs committee, helped organize a canned food drive Nov. 22 for neighborhood residents. The committee worked with Capt. Eileen Bradley of Campus Safety, who Bias said was acquainted with food recipients through her own efforts. Students collected and boxed food, in addition to personally delivering boxes to homes. Bias’s committee completed its second block clean-up on Sunday, Nov. 20, starting from the intersection of 16th Street and Montgomery Avenue. On site were members of the Alpha Phi Alpha fraternity, as well as former brothers, and community members. Meanwhile, in preparation for the spring semester, the TSG recruitment and retention committee will collaborate with the TSG admissions committee in reaching out to local high school students. “We’re looking to promote more areas of Temple,” said Alyssa Ecker, director of the recruitment and retention committee. Ecker said TSG will hold a “bonding event” dinner, where all TSG committees will convene to update one another on their progress. The date for the dinner is not confirmed. Griffin announced that the Campus Safety Forum, a chance for students to speak directly with the Campus Safety and Facilities offices, will be held Wednesday, Nov. 30 at 4 p.m. in Room 102 of Barton Hall B.